While Tennesseans continue to speculate on who will become the next Commissioner of Education, one prominent name is apparently out of the running. Shelby County Director of Schools Dorsey Hopson announced today he is resigning his post effective January 2019 to take a job with Cigna. Calling the last six years the “most rewarding years” of his career, Dorsey Hopson today announced that he will soon be ending his tenure as Shelby County Schools’ top educator. “For the past six years, we have worked together to guide this great school district through monumental changes, including a merger, demerger, school closures and a state takeover of some schools,” said Hopson. “Through it all, our educators and supporters have remained committed to aggressively increasing student achievement. Hopson will begin a job in the private sector in January 2019 saying it was an extremely difficult decision but one that will afford him more time with his family. In addition, he said he now looks forward to supporting Shelby County Schools as an involved parent and community member. 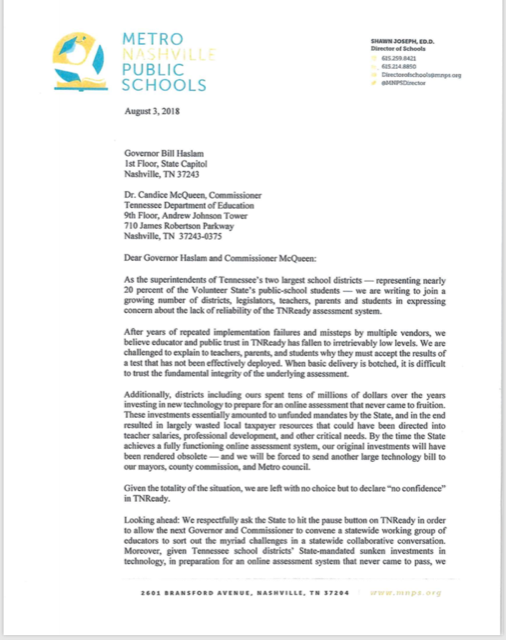 “This is the third year in a row that we’ve experienced issues regarding TNReady, which leads us to have zero confidence in TNReady, Commissioner McQueen and the Tennessee Department of Education,” said Shelby County UEA President Tikeila Rucker on behalf of the union’s 2,000 members. The UEA is calling for all scores from this year to be invalidated and for a moratorium on using TNReady scores in the state’s accountability system until 2021.